When I was in the UK, I bought up some soaps from Lush and the Lush Porridge Soap caught my nose because I liked the smell. It smells not of porridge or oats but of milky creamy sweet vanilla dessert which is sorta delicious. I liked how it kept my bathroom smelling nice all the time and on the skin, I liked how smooth and creamy it felt. It was lovely! It went on my skin like cream and did not dry out my skin one bit. In fact, I’d go so far as to say that its lovely for dry skin. This Porridge Soap has a very soft texture, rather like Play-Doh. When softened in the shower, its quite malleable. But that’s not what bothers me. What bothers me is the bits of oats or whathaveyou that’s stuck to it. These bits act like a gentle scrub on the skin which is nice, but they fall off! And all over my shower floor! After every shower, I’d have to wash down my shower stall because all these bits are everywhere. Also, for some reason, when the bits are exposed to the air, they take on a dark brown colour which makes the soap look very unappetizing. Almost disgusting to my eyes. And it melts very fast. Perhaps its our warm weather, or perhaps its the hot water, I can’t tell. I used it till there was about a fistful left and then I could bear it no longer for messing up my bathroom and tossed out the remainder. Lush soaps are sold by weight and this one’s about £2.65/100g. I cannot remember how much this piece was. But its not cheap. I haven’t had many good experiences with Lush soaps, to be honest. Nothing I’ve tried has wow-ed me and I find the scent too strong. Yet being a bath junkie, I find myself drawn to the store every time I come across one. Crazy and sad but true. Sigh… I should learn shouldn’t I? 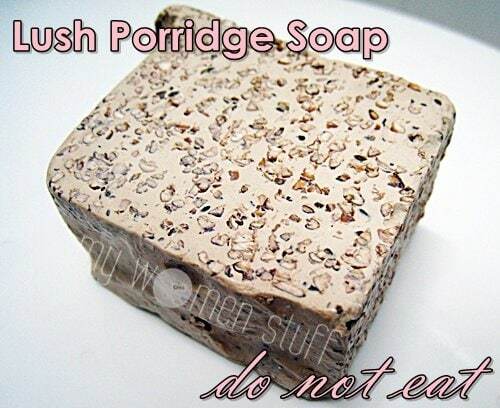 Have you tried the Lush Porridge Soap? Do you like it? Does Lush work for you in general? If I’d known I’d have given this to you but then I’d used it so not a good idea wot? 😛 And gee! I don’t want to smell like an armpit! No Figs and Leaves for me! Yes! I remember all too well – cockroach eggs! 😛 I gotta agree though. They looked absolutely disgusting once they turned brown eww! I’m a Lush ballistics and bubble bars lover. I’ve never tried their soaps before. I’ve tried their lotion and hand cream but I don’t really like them. You glutton for punishment! Its a really nice soap but without the bits. I’ll say I told you so when you complain back about the bits all over your floor LOL! I must agree with Geekchic. I get totally overwhelmed by the strong scents every time I tried to enter one of the Lush shops. I went down to the basement level of the one at Covent Gardern and had to run out again before I passed out. Really frustrating because the stuff there looked so cool to play around with and I really wanted to get a pot of “It Started With A Kiss”. I love the porridge soap! I know the scrubs falls off and look unsightly but it’s so awesome….! Oh wait! A friend tried that mask too and complained of itch! You aren’t alone! I have never tried their soaps, but I got a friend to get me Big shampoo, Seanik solid shampoo, Dark Angels cleanser and Mask of Magnaminty from UK. I LOVE the shampoos, but I find the face stuff just so-so. Not a fan of Lush after my previous purchase. Dries my skin real bad. Reading this assures me no more lush product for me please heh. I live in Canada and I can definitely say that the climate is not hot here 😉 I got the Lush porridge soap because I’m just a sucker for anything that smells that yummy! I agree that it leaves the skin feeling very soft, moisturized, and clean, but the small bits also really drove me crazy, and the soap melted into a squishy pile…I think it’s probably an effect of the hot water/steam from a shower more than the climate, but who knows really! Mine definitely did melt though, and like you I couldn’t bear to stare at it so I threw out the last little bit…it looked so…unappetizing!